An excellent starter blaster with lots of potential. 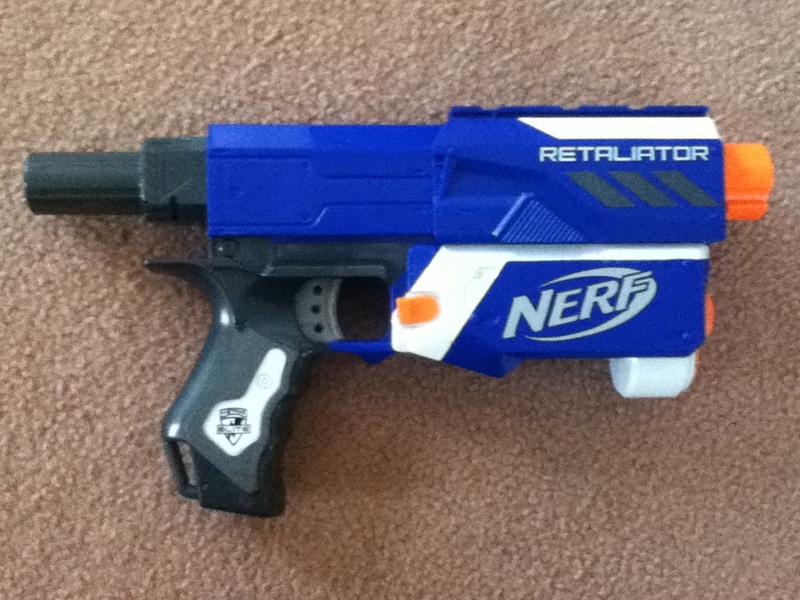 The Retaliator was one of the first Elite blasters released in late 2012, a redesign of the popular (but old and obsolete) N-Strike Recon CS-6. 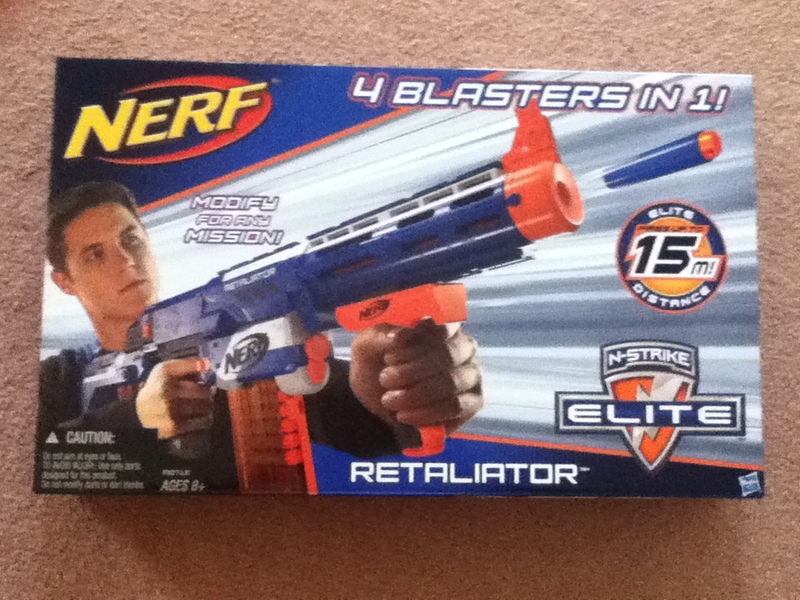 Even today it remains quite a popular and recommended blaster. 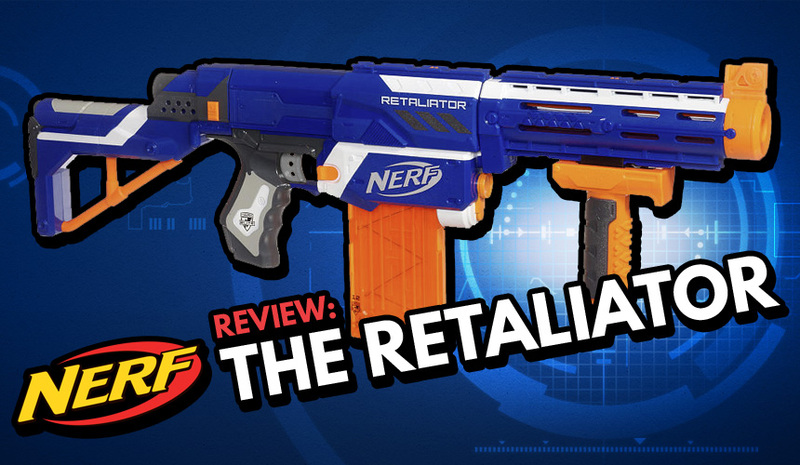 3 years on from release, I’ll look at why the Retaliator is still such a good seller. 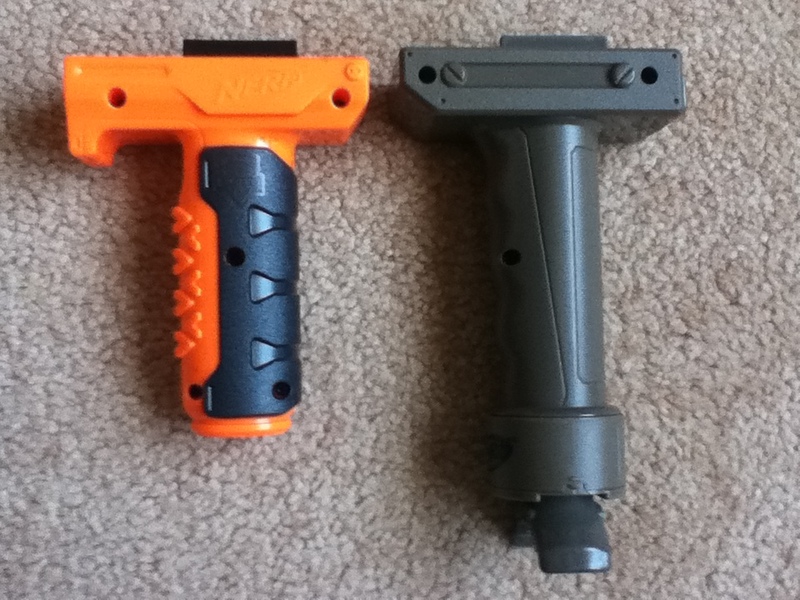 The base Retal blaster is quite compact and small, it’s the simplest and most compact of the spring powered clip (mag) system blasters that Nerf makes. 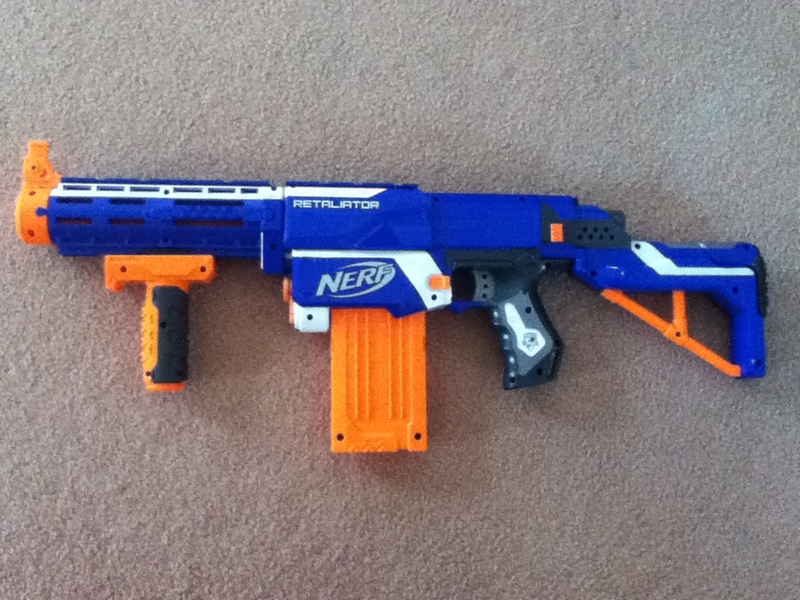 To maintain its compact form, the Retaliator is actuated with a top slide. Unfortunately, this style of slide is generally considered quite unergonomic compared to most other priming mechanisms, particularly the shotgun style pump action. Additionally, the one tactical rail on the base Retaliator is located on the slide, so attaching accessories tends to make priming significantly harder. 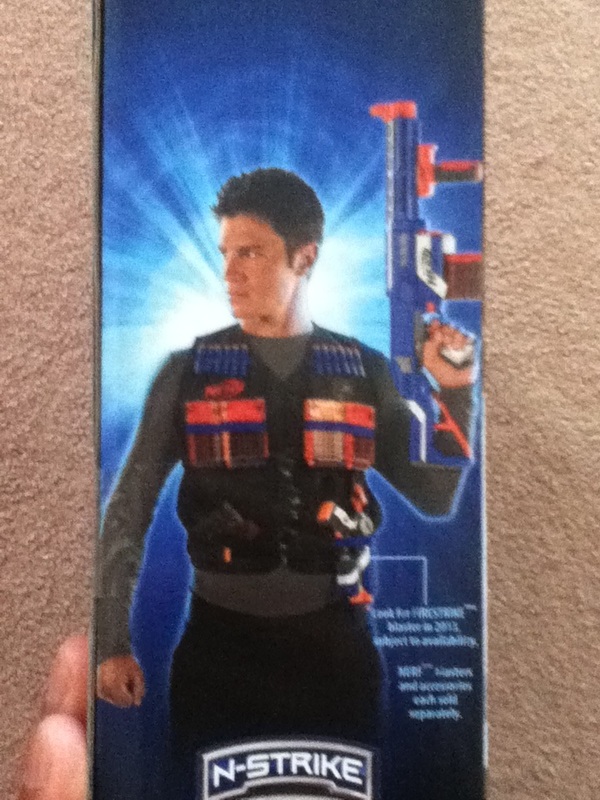 The handle is quite comfortable, though this is the case for most Elite blasters. 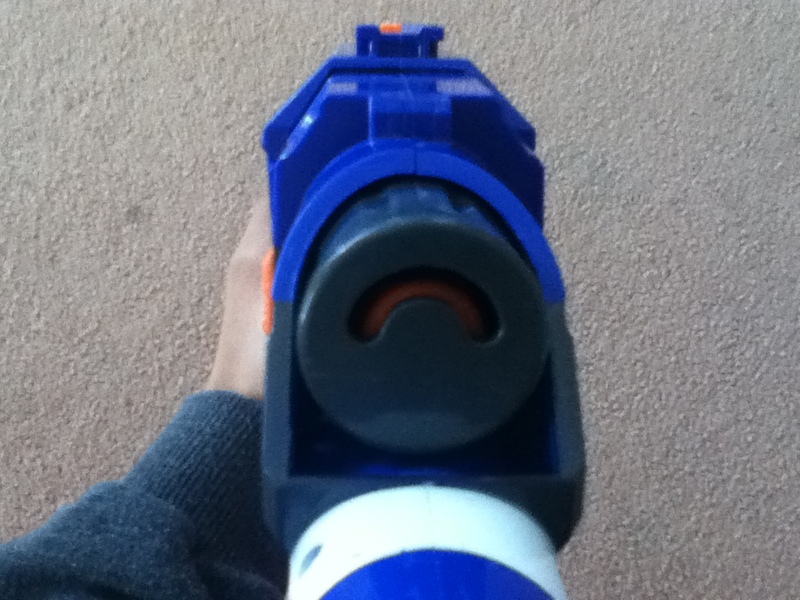 The clip (mag) release buttons are situated in a familiar place, right in front of the trigger, just behind the magwell. They’re easy to reach and pull with your trigger finger. 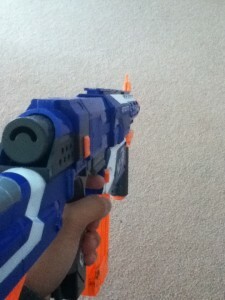 Using the Retaliator is relatively simple: Pull the slide all the way back to prime the blaster – this can be seen by the prime indicator at the rear, which will turn orange. 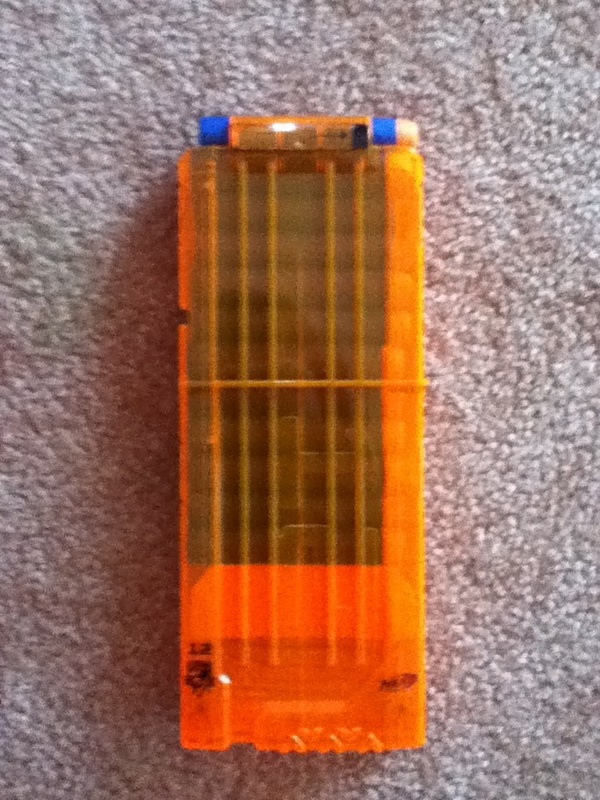 When the slide is fully back, the clip (mag) can be removed and replaced, and the flip-up jam door can be opened. 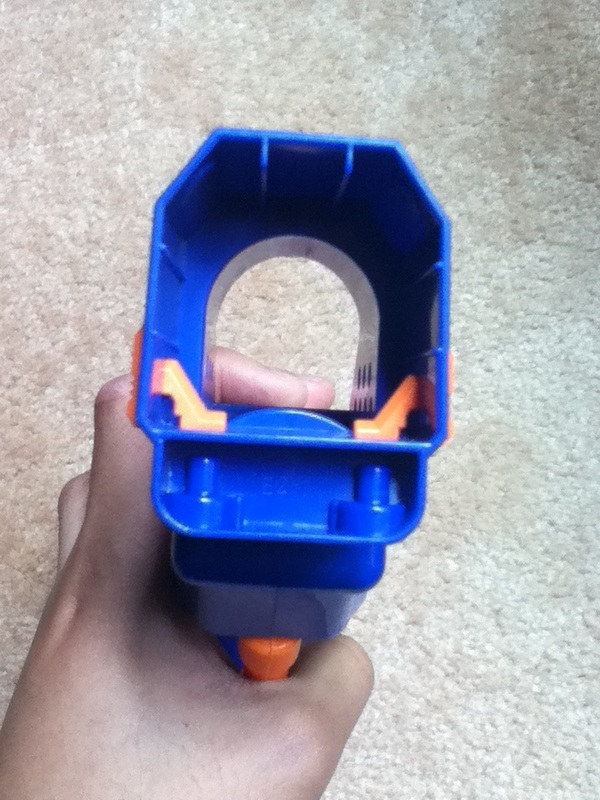 Once the clip (mag) has been replaced, pushing the slide all the way forward will chamber a dart, at which point the trigger can be pulled to fire the chambered dart. The process must be repeated for each dart. 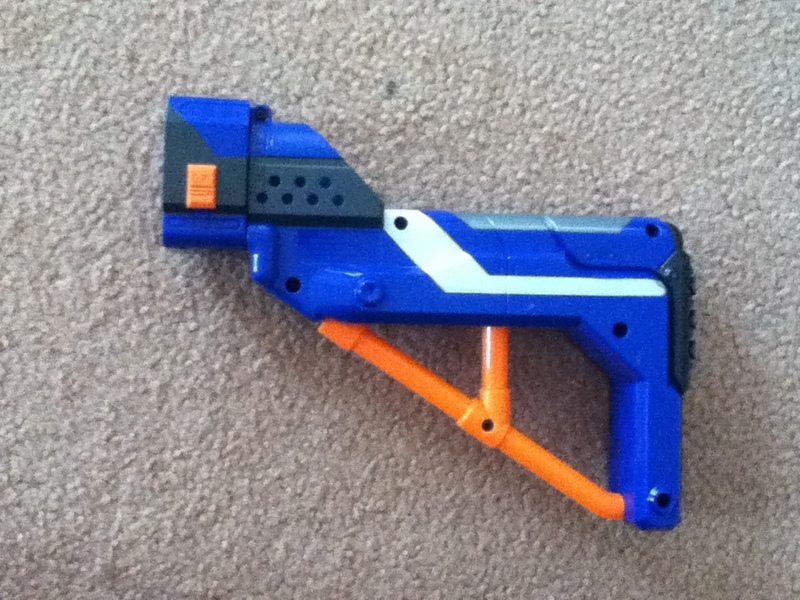 The Retaliator has the standard fare of clip (mag) system blaster locks. 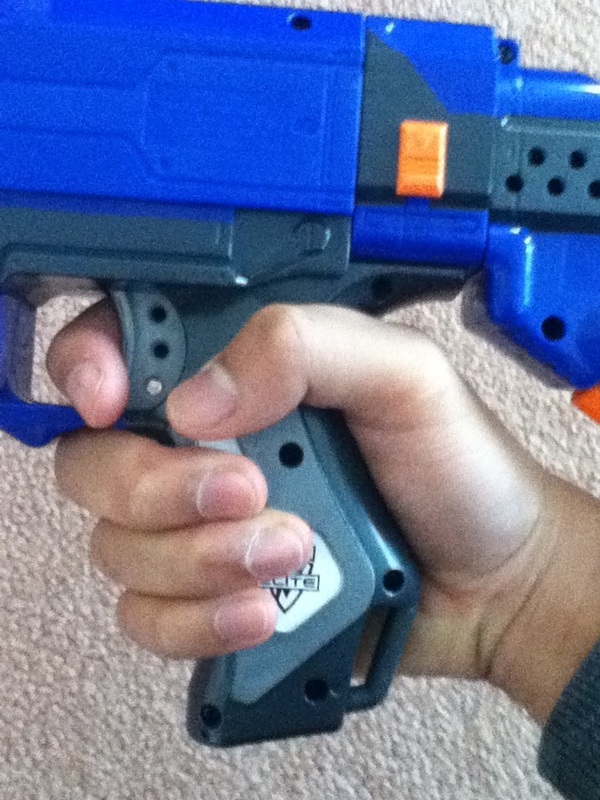 First is a piece that prevents the trigger from being pulled unless the slide is fully forward. The next is a piece that stops the slide at about half way, requiring the slide to be pulled fully back before it can move forward. Once a dart is chambered, the slide cannot be pulled back until it is fired. Finally, the clip (mag) release is locked unless the slide is fully back. 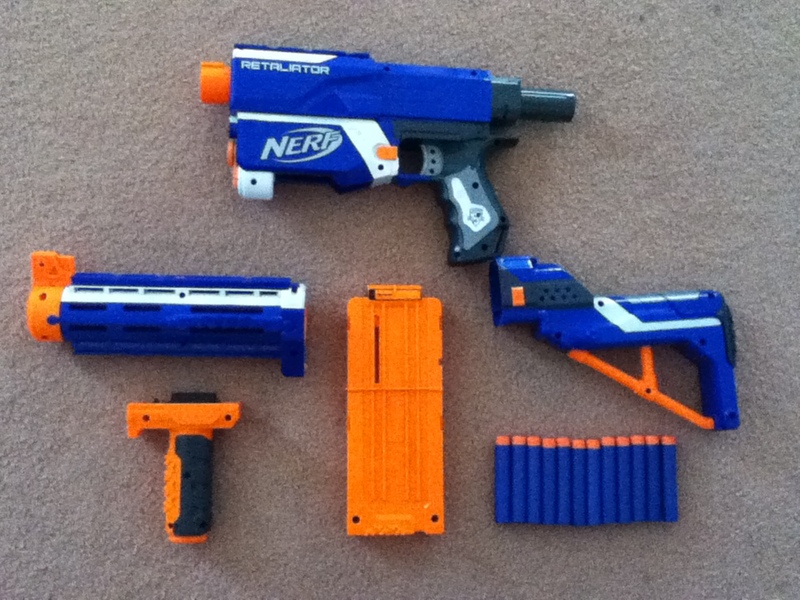 One of the main draws of the Retaliator is its extra accessories. 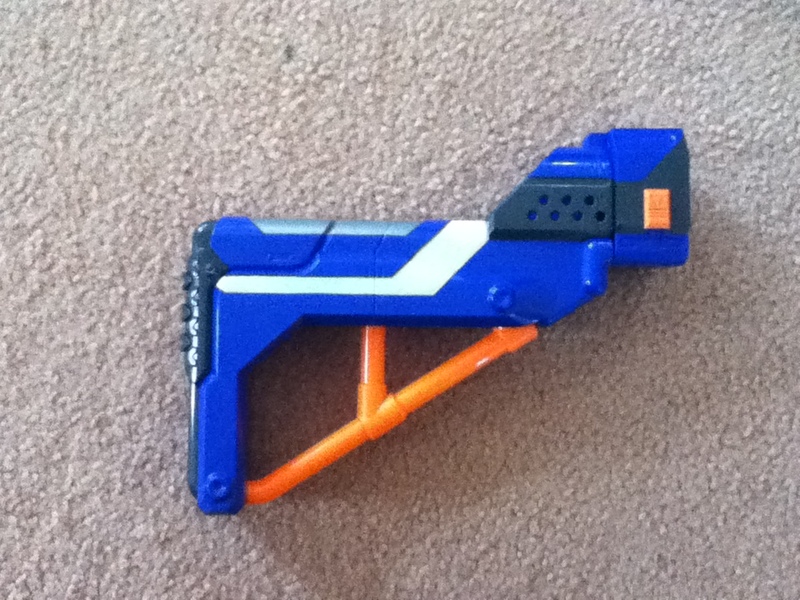 Even today it remains a good way of obtaining extra parts for customising blasters. 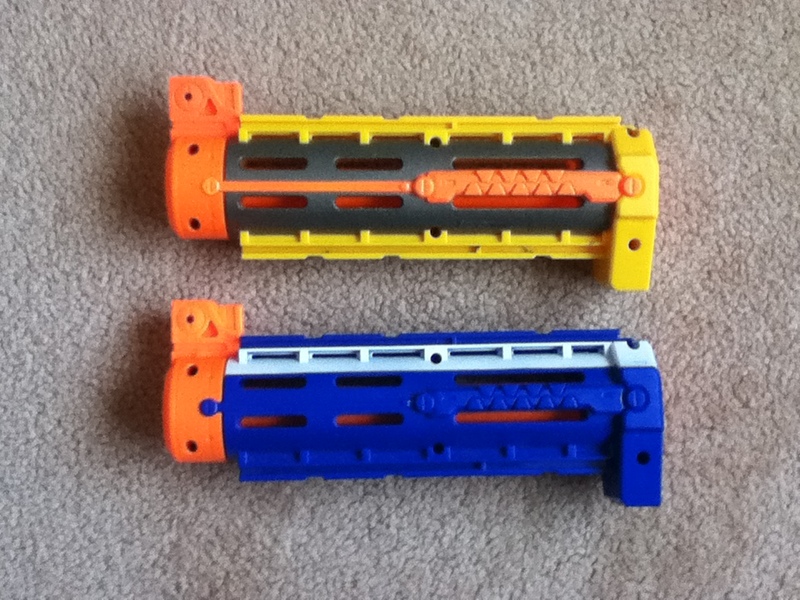 The Retaliator barrel extension is a medium length piece that twist-locks onto the Retaliator muzzle, as well as any other blasters with the same muzzle, of which there are many. 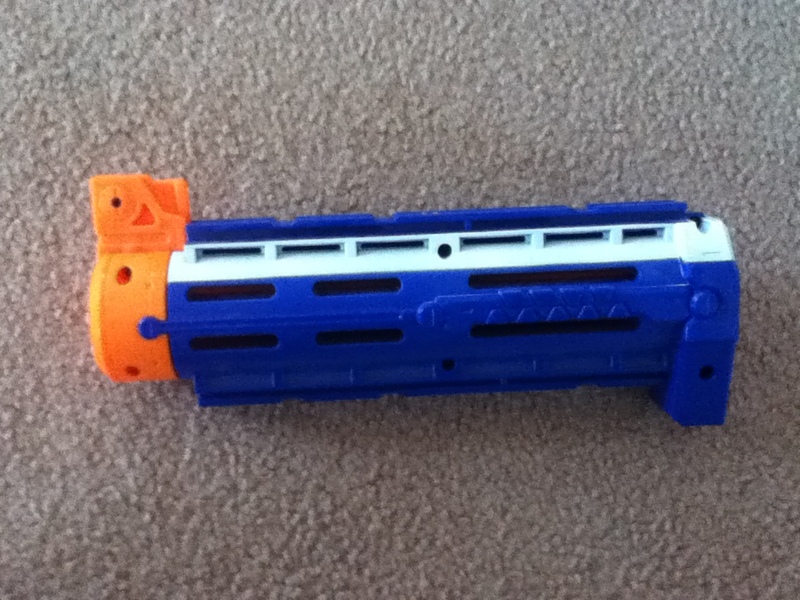 It has two tactical rails, one on top and one on the bottom. On top of those it also sports a flip up iron sight on the front. Its most popular use besides aesthetics is as a mounting point for underbarrel blasters, of which the Roughcut 2×4 is a popular choice. 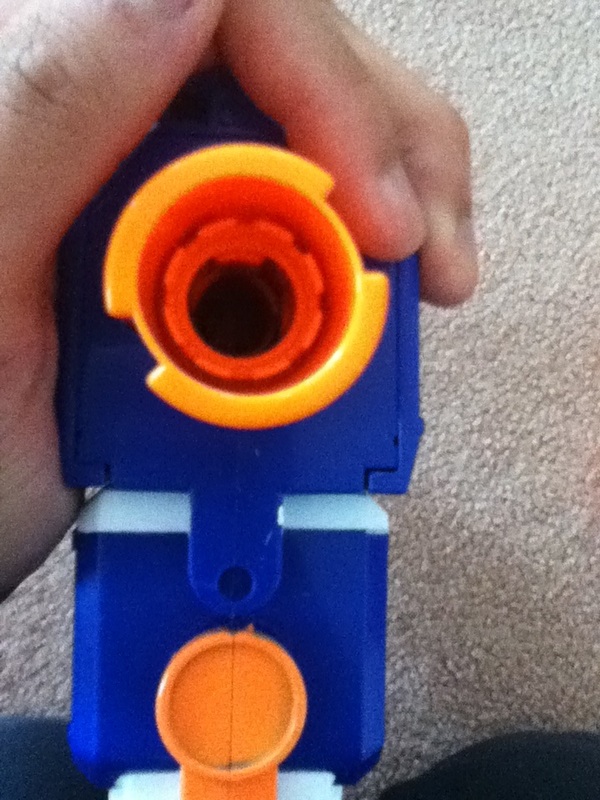 The Retaliator barrel, due to its faux barrel, slows down darts that are fired through it. In the process, this tends to also help stabilise the notoriously unstable Elite dart. 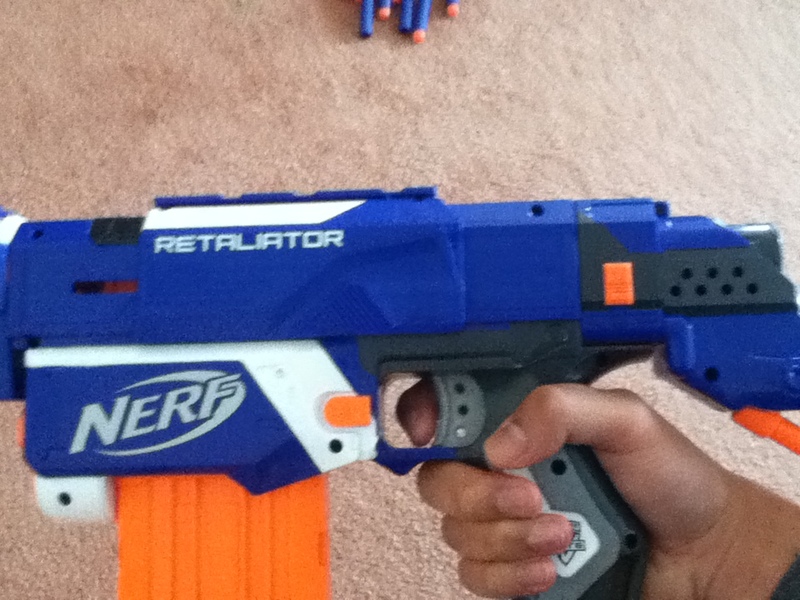 The Retaliator includes a foregrip, which is pretty basic. No special features, just a stylised cylinder. Whether you find it comfortable will be based on how large your hand is and your personal preference of grip. I quite like the Retal grip personally. 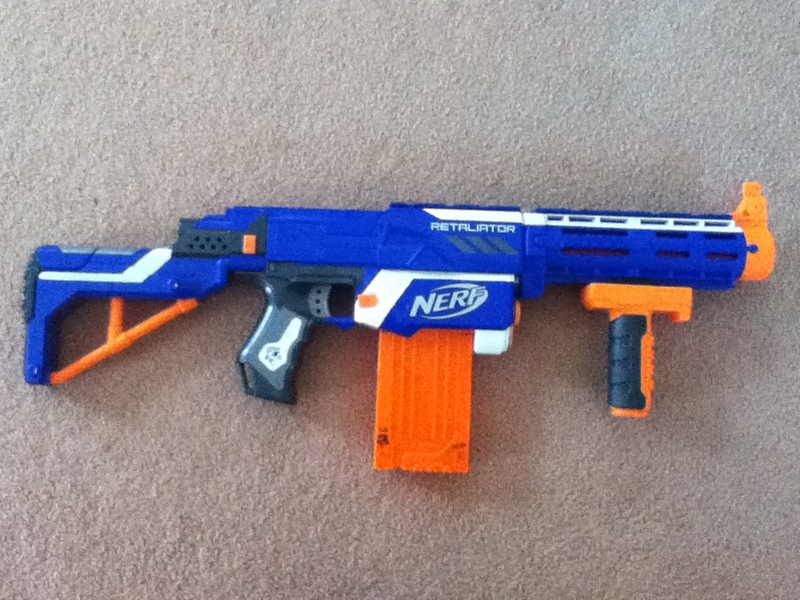 The Retaliator’s stock is a unique piece, it’s a very, very short stock that has been found by many users to be unusably short. Kids might find the stock to be the right length, but any larger persons will likely find it unusable. The Retaliator includes a 12-dart Elite clip (mag), which was new at its release. 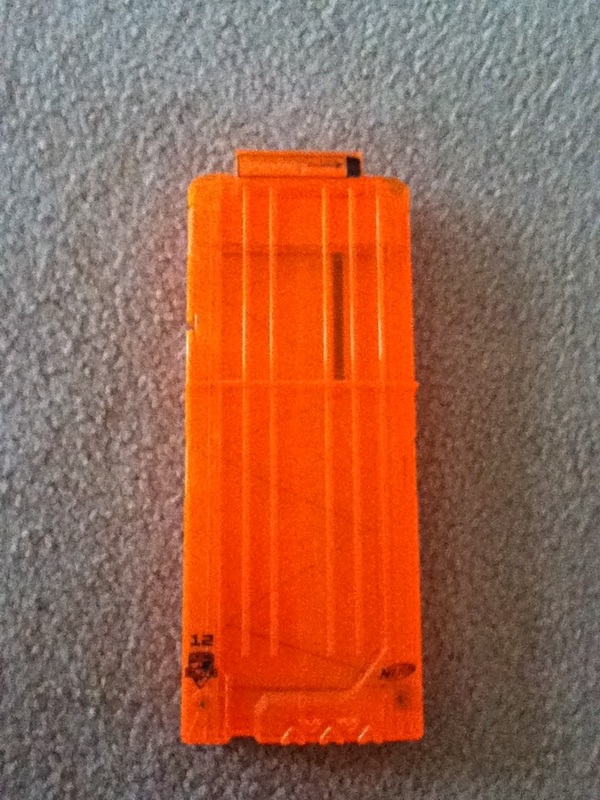 The 12 clip (mag) is quite a popular size, it holds enough darts to sustain blasting while not being so large as to become particularly unwieldy. Otherwise it’s pretty standard for a Nerf clip (mag). Without the barrel, a grey trigger Retaliator typically achieves ranges of 10-14m parallel to ground, and is quite erratic using Elite darts. Accuracy likewise is very poor due to the erratic nature of Elite darts. With the barrel, a grey trigger Retaliator typically achieves ranges of around 12-13m parallel to ground, and is far more consistent and accurate than its barrelless version. Accuracy is still not perfect, thanks to the Elite darts, but much more usable than barrelless. 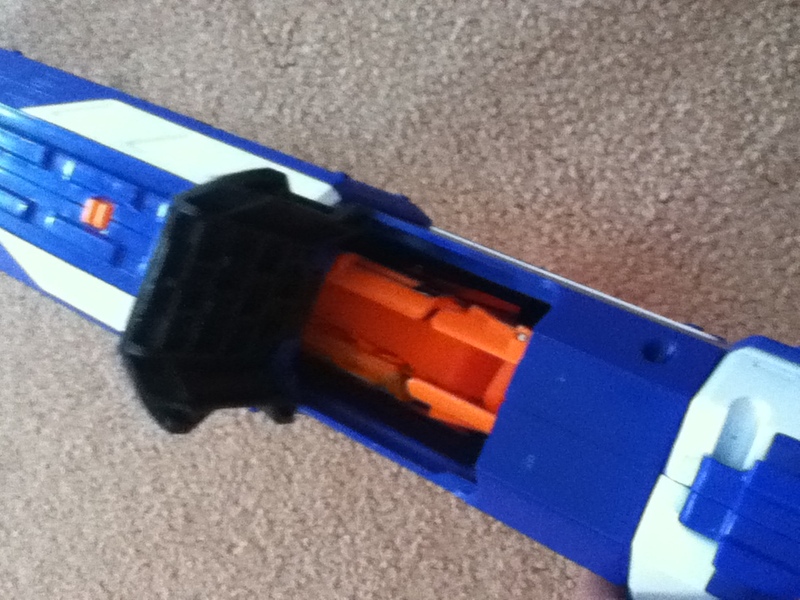 Rate of fire is 2-3 darts per second at best, which typically requires lock removal for smoothest operation. Certainly usable, but it does fall short compared to a lot of its competitors such as the flywheel blasters. As one of the most powerful of the Elite blasters, the Retaliator lends itself well to firing off darts from longer range. Its unusually high muzzle velocity gives it a slightly longer range than most of its fellow blasters. With its somewhat limited ROF, the Retal is not ideal for putting out a lot of darts, though if necessary can do so surprisingly effectively. Note that the accessories are typically seen as not useful. While my testing has shown that the barrels help accuracy quite a bit, others seem to have experienced much less impressive results. 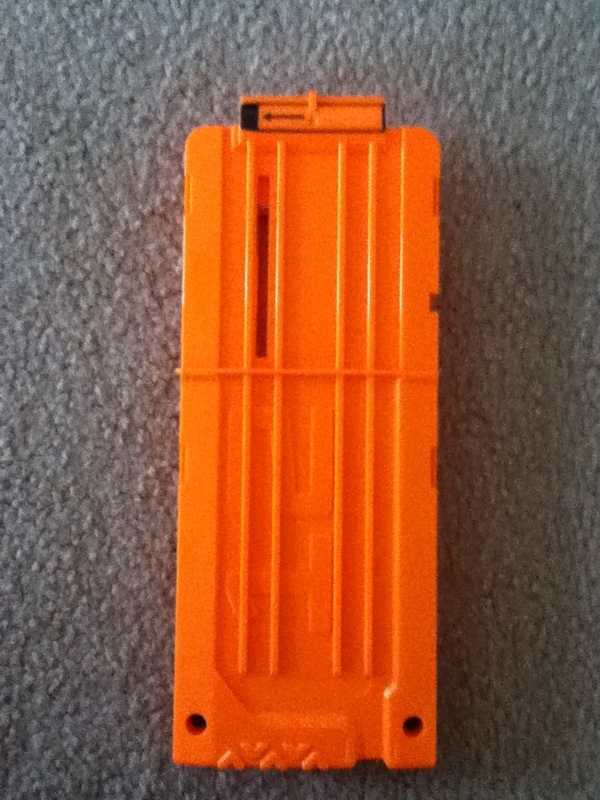 For the most part, Retal barrels are kept around for pump grip mods (see below). Since the Retaliator has a slide prime, the foregrip is completely unnecessary, and the stock is also typically seen as too short to use. 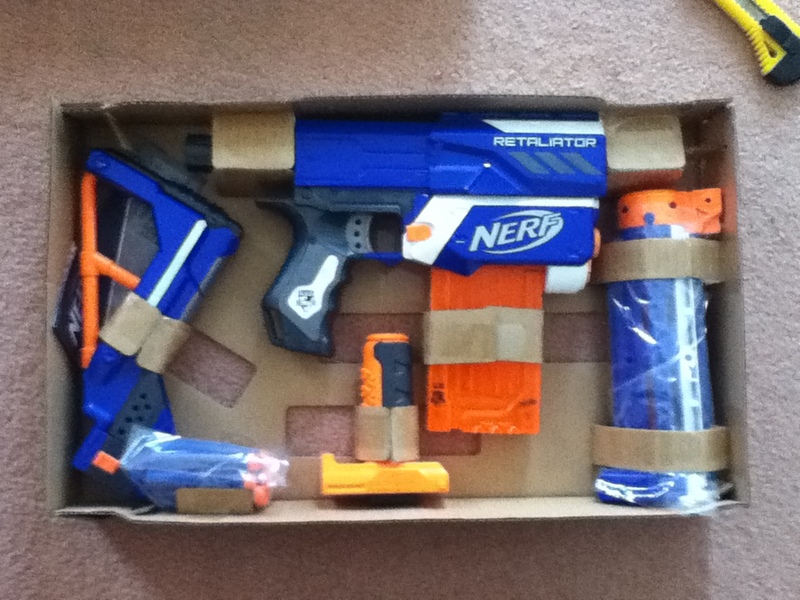 As such the recommended setup of a Retaliator is without any of its attachments, just the bare blaster with clips (mags). This gives rise to one of its most common descriptions, a pistol-dressed-as-rifle. Despite having the attachments to be a rifle, a stock Retaliator is typically best used as a bare pistol. 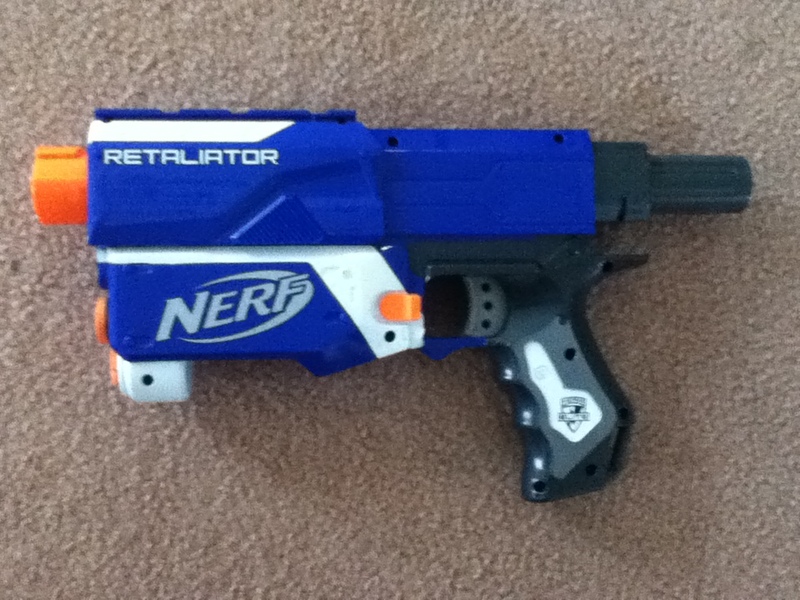 At release the Retaliator was typically around 40AUD, however more recently has dropped to 30AUD and can be found at Kmarts in its white XD incarnation. 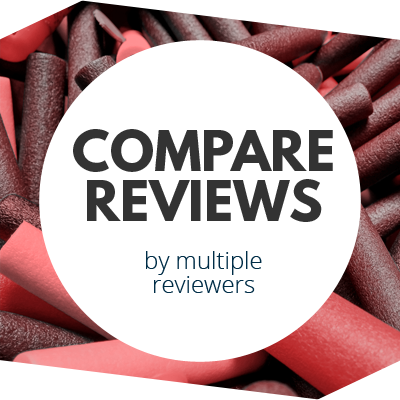 It remains one of the most accessory-packed blasters available, no blaster with similar or superior accessorisation can be found at a competitive price. Additionally the Retaliator itself is a very solid and effective blaster. All round the Retaliator is quite a good buy and deserves a place in everyone’s Nerf collections. Now this is where a Retaliator really comes into its own. 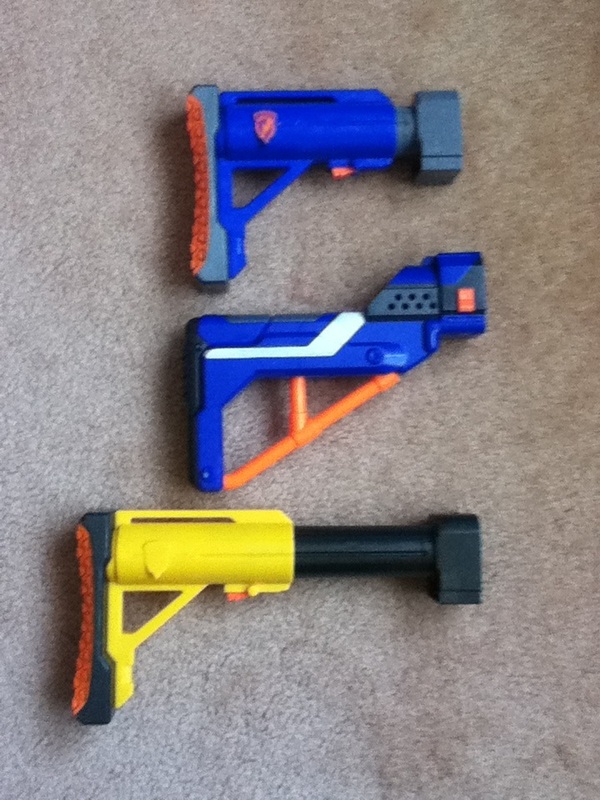 Through experience and testing, the Retaliator has been found to have the best internals of all its variants (Rampage, Elite Alpha Trooper, Slingfire). 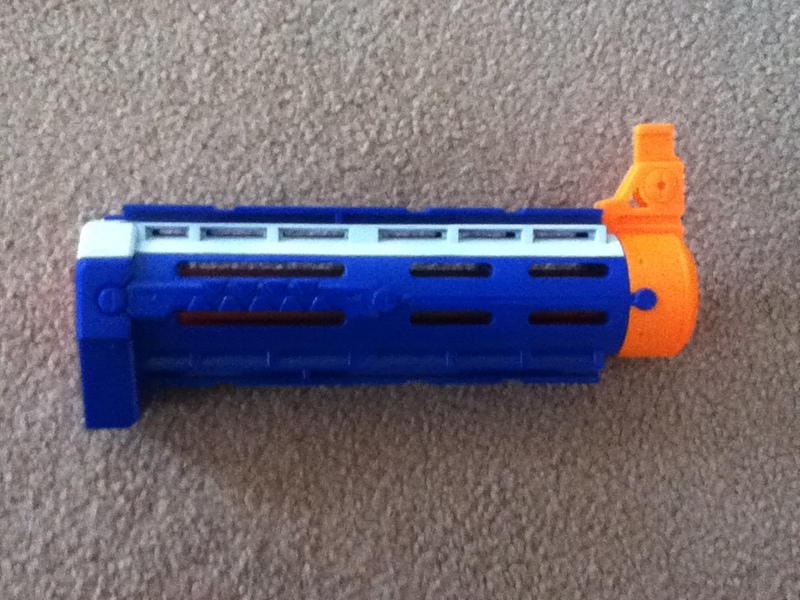 It outperforms all of them when the same modifications are performed, even with its barrel attached. Additionally the Retal’s internals have been found to be the most robust of the lot, and can be put through a lot of abuse. A simple spring upgrade from any one of several aftermarket parts vendors will get a Retaliator firing darts at “superstock” velocities, at and over 100fps at the muzzle. 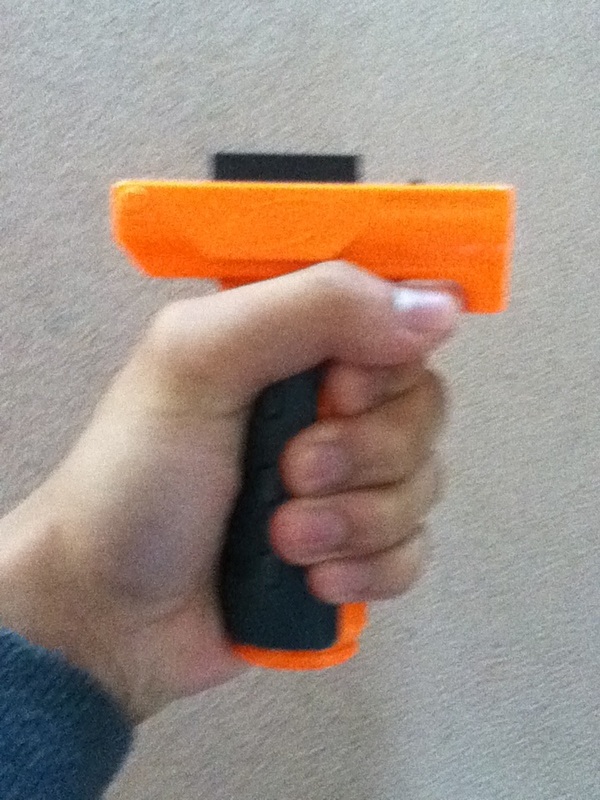 This is in comparison to a stock orange trigger Retal firing at about 75fps, and a grey trigger Retal much less. Since the Retal’s internals are quite efficient and reasonably robust, all that is necessary internally is the upgrade spring and a new catch spring. 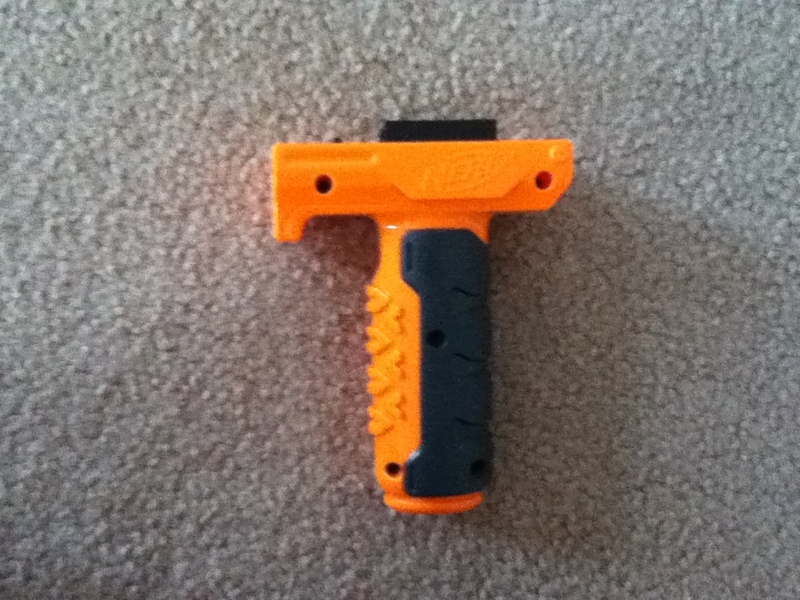 An extremely popular mod for the Retaliator is a pump-grip mod, where an aftermarket pump grip is purchased and attached to the Retaliator’s internals, such that the Retaliator becomes a pump action blaster. 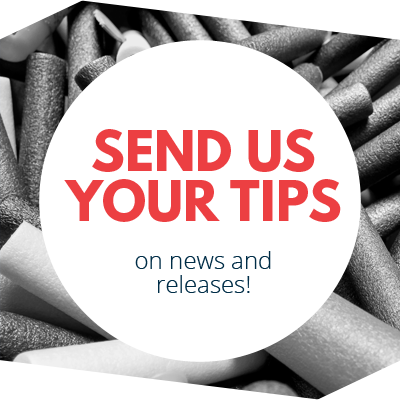 This solves the biggest issue for most people with the Retaliator, eliminating the awkward top slide and replacing it with a far more ergonomic solution. A combination of spring upgrade and pump grip turn the Retaliator from a solid but awkward pistol-dressed-as-rifle into one of the most popular rifle-style primary blasters for “superstock”. 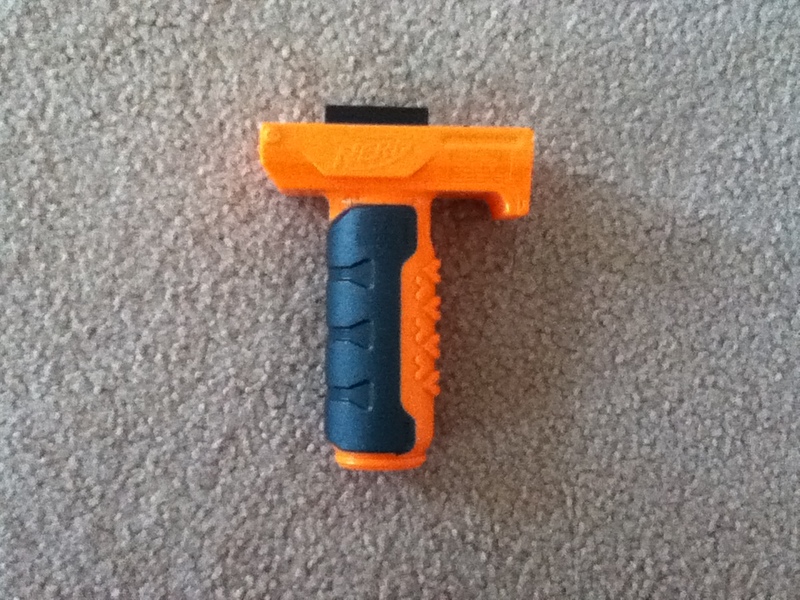 While not particularly cheap to construct (the pump grip can cost a fair amount of money), it is very easy to do even as a beginner, and gives immediate and significant improvements. I see a significant number of them at Melbourne Humans vs Zombies. 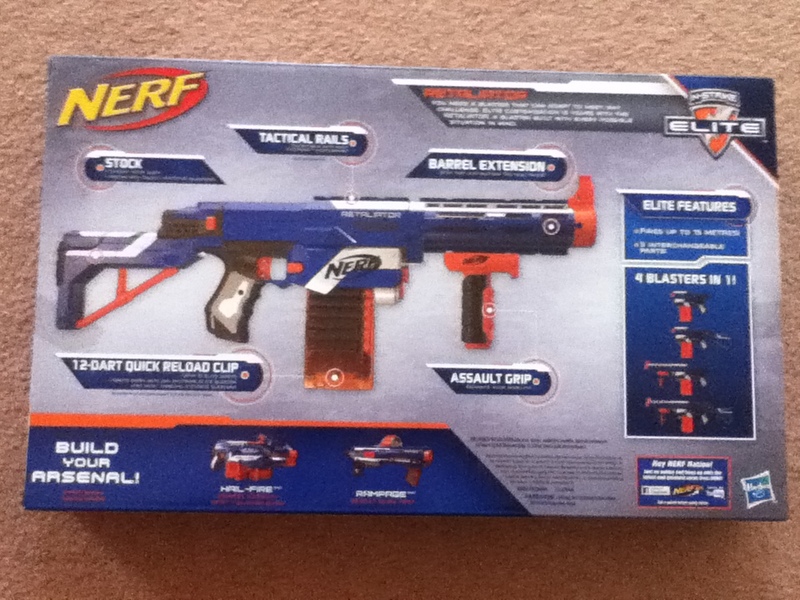 This entry was posted in Dart Blasters, Reviews and tagged 15m, australia, elite, grey, nerf, retaliator, review, trigger on November 27, 2015 by Outback Nerf.